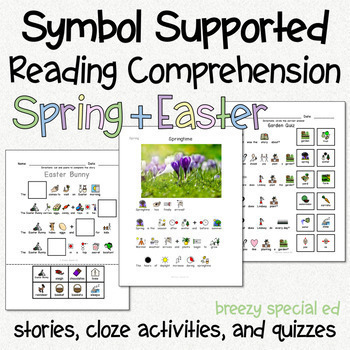 Designed for non-to-beginning writers, symbol picture support helps special education students be more successful at reading in these Springtime and Easter symbol stories! 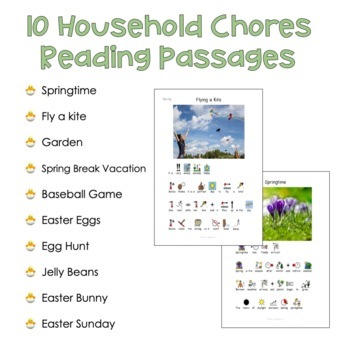 These ten reading passages are all about springtime and easter including: springtime, flying a kite, garden, spring break vacation, baseball game, Easter eggs, Easter egg hunt, jelly beans, Easter Bunny, and Easter Sunday! 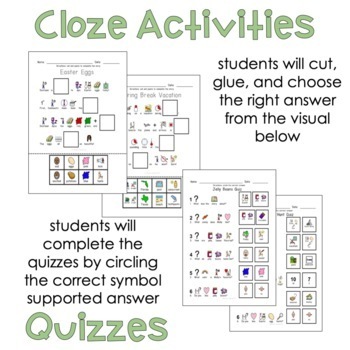 Each story includes: a short and simple 4-5 sentence story, a cut and paste cloze (fill in the blank) activity, and a quiz. Everything is NO PREP! 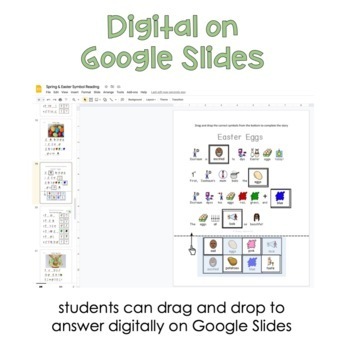 Just print and you are ready to use! Perfect for Springtime and Easter! Appropriate for special education classrooms of all ages!